Coagh Soldiers and Sailors War Memorial 2012 lies at the junction of the main street and the B160 in the centre of Coagh. From the Mid Ulster Mail. Thursday 30 May 2013. 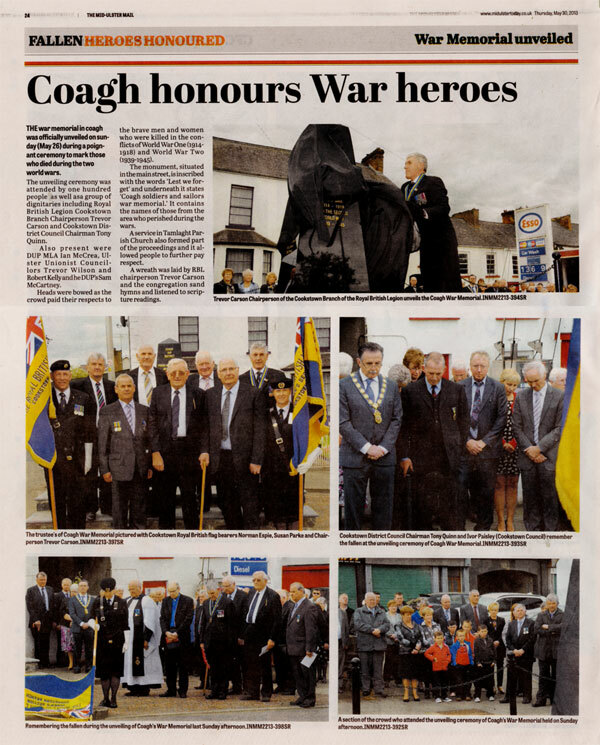 The War Memorial in Coagh was officially unveiled on Sunday 26th May 2013 during a poignant ceremony to mark those who died during the two world wars. The unveiling ceremony was attended by one hundred people as well as a group of dignitaries including Royal British Legion Cookstown Branch Chairperson Trevor Carson and Cookstown District council Chairman Tony Quinn. Also present were DUP MLA Ian McCrea, Ulster Unionist Councillors Trevor Wilson and Robert Kelly and the DUP’s Sam McCartney. Heads were bowed as the crowd paid their respects to the brave men and women who were killed in the conflicts of World War One (1914-1818) and World War Two (1939-1945). 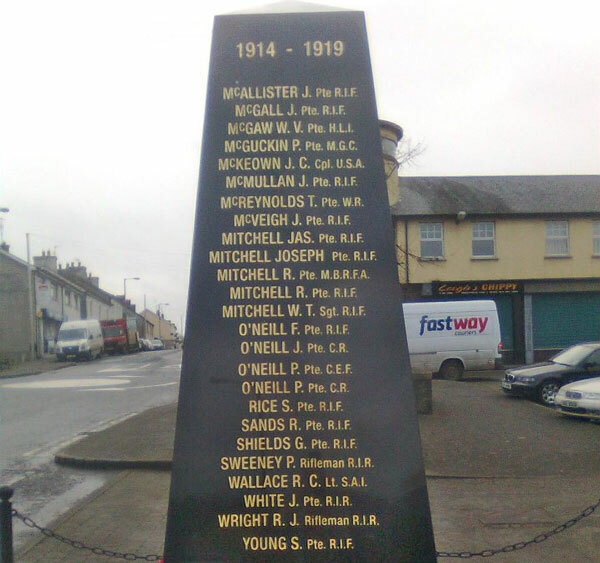 The monument, situated in the main street, is inscribed with the words “Lest We Forget” and underneath it states “Coagh soldiers and sailors war memorial”. It contains the names of those from the area who perished during the wars. A service in Tamlaght Parish Church also formed part of the proceedings and it allowed people to further pay respect. A wreath was laid by RBL chairperson Trevor Carson and the congregation sang hymns and listened to scripture readings.